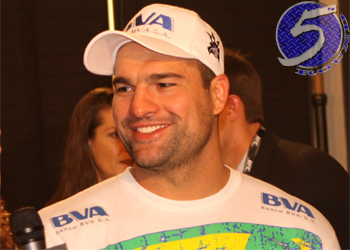 As the old adage goes, “There are always three sides to every story: His side, your side and the truth.” Although UFC president Dana White claimed Mauricio “Shogun” Rua (Pictured) informed him he’d rather be cut than to have to face up-and-comer Glover Teixeira, the former light heavyweight champ professes no such nonsense was ever uttered from his lips. “They asked me to fight Glover, my manager told me and then I talked to my team and we decided not to fight Glover because he’s a top guy, but he’s building a career in the UFC,” Shogun told Tatame. “He fought once and it was on an undercard, so it’s not fair. If I defeated him, I wouldn’t reach a level of having a chance at the title. Three, four fights from now it’s possible, but not now. Shogun’s logic makes perfect sense if he’s hoping his next win will catapult him into a championship affair. However, it’s tough to imagine a highlight-reel victory over Brandon Vera would warrant one. “The Truth” posted a unanimous decision win over Eliot Marshall in his last outing. It was the first time Vera had sniffed the win column since August of 2009. Although Vera does possess an extensive UFC résumé, he’s gone just 7-5-1 inside the Octagon and has never competed for the hardware. On the flipside, White’s motives for wanting to arrange a Shogun vs. Teixeira shootout is also understandable. Current 205-pound champion Jon Jones annihilated Shogun en route to taking his belt, and it appears “Bones'” lengthy reign in only just beginning. White’s a promoter and it’s his job to continually develop the next generation of champions and challengers. There’s no faster way to build a reputation than by taking out a former title holder who’s still in his prime. In the meantime, Shogun and Vera will headline the UFC’s fourth show on FOX. It’s not the scrap White originally wanted, but at least Vera is a bigger name than Teixeira. Unfortunately for fight fans, it just may not result in a more box office bout.